A CH-53K King Stallion conducts its first hover with a 12,0000-pound load Apr. 19, 2016, at Sikorsky Aircraft Corporation’s Development Flight Center in West Palm Beach, Fla.
A CH-53K King Stallion, the U.S. Marine Corps’ newest helicopter, completed its first external load flight test Apr. 19 at Sikorsky Aircraft Corporation’s Development Flight Center in West Palm Beach, Fla., suspending, then releasing, a 12,000-pound load. 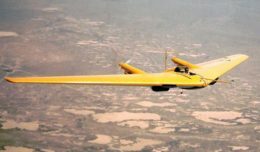 Further tests will continue to expand the envelope with external payloads of 12,000 pounds flown first in hover, then incrementally increasing speeds up to 120 knots, followed by 20,000 and 27,000 pound external payloads. 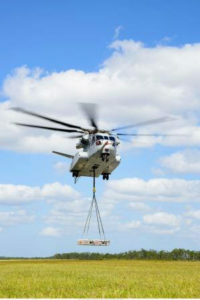 The CH-53K King Stallion is equipped with single, dual, and triple external cargo hook capability that will allow for the transfer of three independent external loads to three separate landing zones in support of distributed operations in one single sortie without having to return to a ship or other logistical hub. The three external cargo hooks include a single center point hook with a 36,000 pound capability and dual-point hooks, each capable of carrying up to 25,200 pounds. The system features an electrical load release capability from the cockpit and cabin, and a mechanical load release capability at each of the pendant locations. An auto-jettison system is incorporated to protect the aircraft in the event of a load attachment point failure.